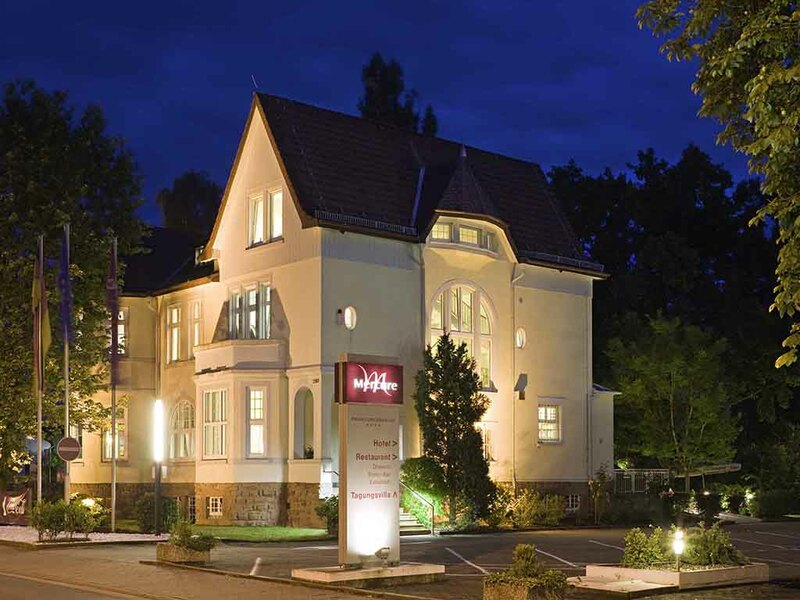 Savor the contemporary atmosphere at the 4-star Mercure Hotel Frankfurt Airport Dreieich: Our hotel is located in quiet park-like grounds on the outskirts of the Rhine-Main metropolis and just 3.7 miles (6 km) from Frankfurt Airport. Our new Art Nouveau-style villa offers nine meeting rooms to cater for your events. If traveling by train, we are 3.7 miles (6 km) from Frankfurt train station and the S-Bahn stops near the hotel. If traveling by car, take the A5 or A3. Dreieich is located in the Frankfurt metropolitan region, the most important metropolitan region in Germany, which is internationally renowned as a location for trade fairs, finance and services, and as a transport hub. The 4-star Mercure Hotel Frankfurt Airport Dreieich offers a choice of Standard Rooms with a single bed, twin beds or a double bed. Superior Rooms with a double bed are air conditioned. Our spacious air-conditioned Suites consist of 2 rooms. Sky Sports can be viewed free of charge in all 92 rooms and free WIFI is also available. Your child aged up to 16 years can share your room at no extra charge. Your pet is also welcome. The contemporary setting and mouth-watering regional and international dishes make our "Prince" restaurant a popular place to kick back in. We are open daily from midday to 2.30pm and 6pm-10pm. The air-conditioned "Diamond" bar serves a wide range of drinks, specialty coffees and hot and cold snacks in a cozy atmosphere. We are open between 6pm and 2am.